Have you ever felt intimidated about pairing food with wine? Whether you’re planning a winery picnic or hosting a wine tasting or casual gathering at home, The CD shares our favorites, from the orthodox to the non-orthodox. Goldfish crackers with rose? Cambozola Bleu with red, white, or rose? Must we always eat cheese? Absolutely not. We’ll share a little something for everywine, er, everyone. One of my favorite weekend activities is a visit to a winery. Even if the wine is overpriced and subpar, the lovely pastoral setting, the fresh air, friends, wine, and of course, food form a winning combination. I love organizing a mini-picnic to make the experience even better. Wherever you’re going and regardless of the wines you’ll likely drink, I have a few ‘standards’ that usually guide my planning. If I’m planning a picnic, presentation is last priority. Mobility and safe storage take precedence. When wind, sudden rain or thunderstorms, and insects are real threats to your picnic (ever had food flip upside down, lost to the birds? ), you can’t worry about setting a nice table. I bring one small cooler for perishables and put everything else in grocery bags or sacks. I keep most every item in its original packaging for easy transport and clean-up. I bring plastic utensils (excepting a sturdy knife for cheese and cutting fruit), and only if necessary, paper plates. I try to pack a picnic that requires no individual utensils and plates, but if you or your friends are weird about dipping crackers and veggies in a communal container of hummus, for example, you may want to bring enough for everyone. 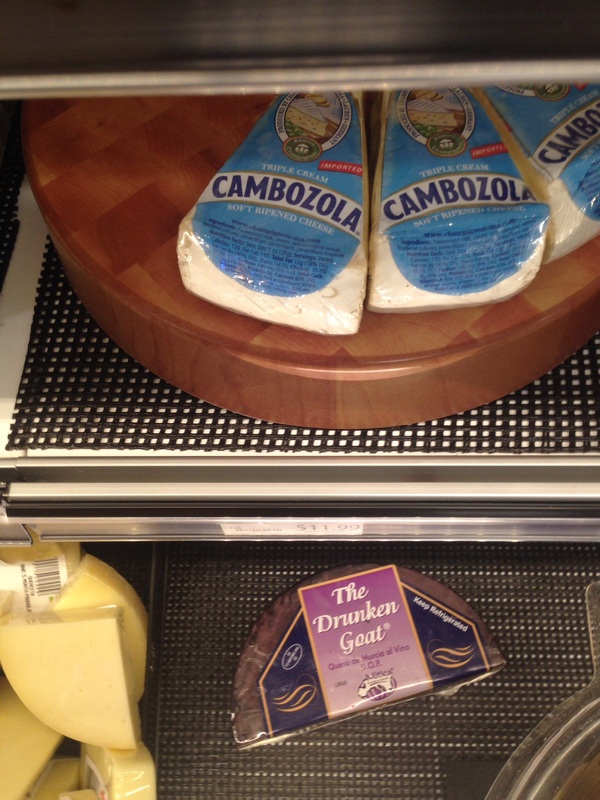 My haul always includes a selection of cheeses. 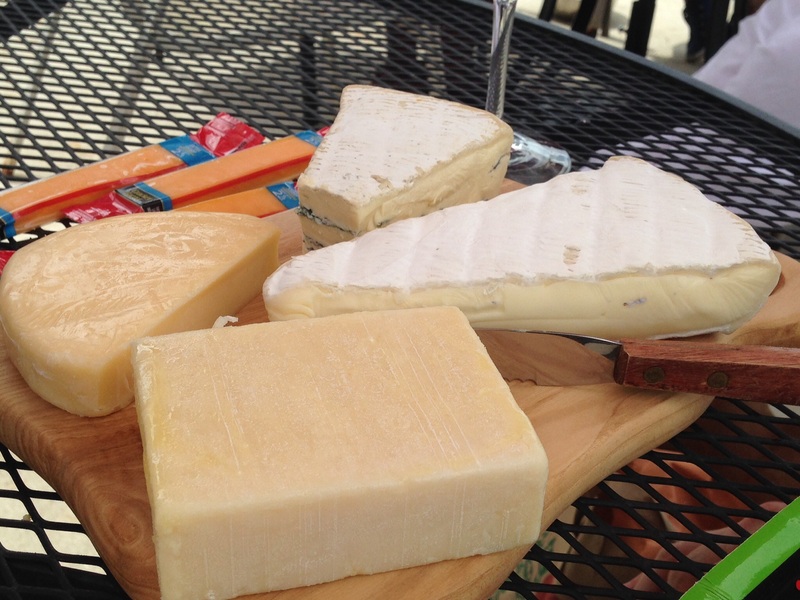 Nothing compliments wine the way cheese does. One arguably can make an entire meal of just wine and cheese, maybe with some bread or crackers, but I like to give options for the non-cheese lovers and some balance to make it a real meal and feast. My rule of thumb is at least one hard cheese and one soft cheese. 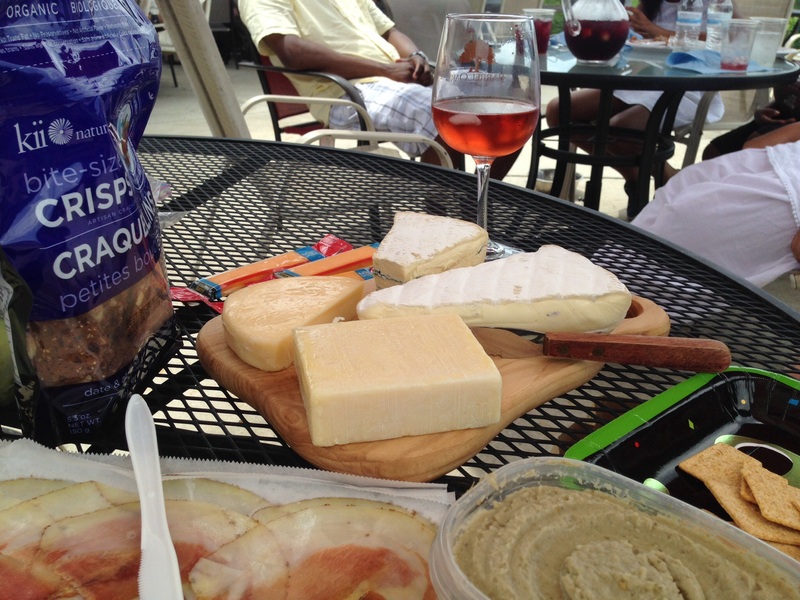 I typically try to bring three types of cheeses, but for a group of two or three people, that may be a bit much. I’ll share a few of my favorites for each category of wine. Brie. One can never go wrong with brie (really, I know how cliched it is, but it’s brie!). Look for triple cream varieties actually imported from France, as American and Canadian produced bries have a firmer texture and lack the complexity in flavor that makes French brie so irresistible. Avoid ‘smelly’ varieties. They taste great out of the refrigerator, but after an hour or two outdoors, the smell can become unbearable. Just ask the passengers on my insanely long train ride through the Alps from Paris to Milan several years ago. As long as you store it appropriately, brie is wonderful with a hot, fresh French baguette or demi loaf, or a sliced, tart apple together to compliment the apple and citrus notes of a good white wine. If you don’t have time for fresh bread, I love brie paired with a sweet, nutty toast. Trader Joe’s Fig and Olive crackers, Rainforest Crisps (any variety), or the Kii Naturals (Canadian) Date and Almond crisps pictured above, are great bets for this or any soft cheese. Emmenthaler. Speaking of the Alps, this firm cheese was elevated to one of my favorites after a long night in Austria. It was delicious with semi-dry Austrian white wines. Its nuttiness also makes it a decent pairing with heavy red wines. Great paired with seeded crispbreads or dark rye bread; it works well with berry jams and dried apricots. Dubliner Irish cheese. This is my go-to cheese. Everyone loves it. It has the mellow nuttiness of Parmesan with a bit more of a tangy, salty kick. It goes with any cracker, plain or flavored. I love them with rosemary flatbread crackers in particular. This cheese is also wonderful with tomatoes – tomato relish or bruscetta mixes. This cheese works with any wine, but it really brings out the citrus notes and sweetness of white wines. Chevre. Whether you pick a ‘naked’ chevre or one rolled in herbs, cranberries, or blueberries, the tanginess of a soft chevre log works well with the bold, berry notes of red wine. Smoked gouda or Old Amsterdam. The two are not synonymous, despite that they both hail from The Netherlands. Smoked gouda really works well with heavier reds with those hard-to-place leather and tobacco notes. If a red is too oaky for me, gouda strangely helps make it more palatable. Old Amsterdam Unikaas is firm, almost crumbly, but it has this wonderfully aged mellowness. It tends to be pretty pricy for a reason. Bleu cheeses. Again, the sharp, tangy character of bleus complements the berry and cherry notes in red wines. I’ll save my favorite bleu for the roses, but I recommend picking a soft or semi-soft bleu. Those are less messy, and I find them to be a bit milder for those who don’t tend to love bleus. Cambozola Blue. With the creaminess and soft texture of camembert (“the Camb”) and a hint of tanginess of gorgonzola (the “zola”), this German soft cheese is the one blue cheese for people who hate blue cheese. Because it is milder than most blues, it is perfectly paired with a semi-dry rose. “Sort-of-blue” meets “sort-of-red”. It’s also great with a sweeter cracker and fruit. Manchego: It may be blasphemy, but it seems like Manchego cheese was made for Spain’s dry rose wines. It has enough bitterness to pair with red, but the nuttiness that works with white, so when you get a rose wine that has characteristics of each, that Manchego sings. Cheddar. I am not a cheddar fan, let me be perfectly clear (English white cheddar being my only exception; its flavor is fuller and more mellow). But if I were to eat cheddar, I would pair it with rose wine. I swear that it is a wonderful combination. I will, however, gladly eat sharp cheddar cheese crackers (think Goldfish or Cheez-Its) with rose wine. It just works. Trust me! Drunken Goat. This slightly nutty, firm, and mild goat cheese is good with any wine, but it is best with rose, in my opinion. Any of the cheeses listed in this post. 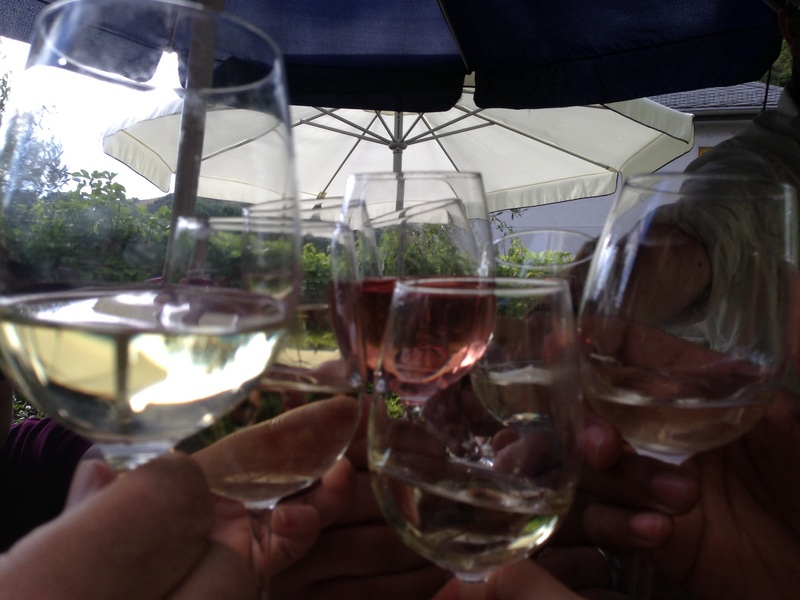 The transitional nature of rose wine (red grapes, less contact with skin!) is suited to a wider variety of cheeses and accompaniments. Just please don’t drink White Zinfandel. Friends don’t let friends drink White Zin, unless it’s before the age of 25 and after the age of 70. I do not categorize it as a rose wine. In general, I stick to soft or semi-soft cheeses, such as brie, Camembert, or a soft, melting goat cheese, when pairing with a sparkling wine. The effervescence and dryness or sweetness do not work as well with sharper and firmer cheeses. But sparkling wine makes everything taste better, so throw caution to the wind and try something new! Though I could, it probably would not be wise. Having a bit of variety can really help play up your wines, not to mention that it will make everyone feel satisfied. Hummus, baba ghanouj, and tzatziki (either purchased or homemade – try my recipes!) are great non-cheese noshes to break up the cheese monotony, and they all are fairly wine-neutral. I bring a variety of crackers, usually driven by the types of cheese I pick, typically a neutral cracker and at least one interesting type of cracker (seeded, sweet, or herbed). A sharp cheddar cracker, even as low-brow as Goldfish or Cheez Its, is spectacular with dry rose wine. Charcuterie: Packaged prosciutto and salamis have become commonplace at most supermarkets and they make a great protein sidekick to cheeses. Add a touch of exotic by visiting a local butcher and trying a specialty meat sliced to order, such as the pork lonzo pictured in the above photo. I also try to bring enough vegetables for dipping and fruit to balance out the indulgence of the cheese. I love sugar snap peas, baby carrots, or bell pepper strips to dip in mezze or top with cheese. Berries work particularly well with red or rose wine, while apples, pears, and even citrus/tropical fruit are better with white or sparkling wine. Mixed nuts are great with sparkling wine; marcona almonds and kalamata olives are fantastic with dry whites, roses, or light reds. Dark chocolate and red or port-style dessert wine is an amazingly simple ending to a wine tasting at home. However, in the heat of summer (or a closed vehicle), it’s not practical to bring dark chocolate bars, and chilling them can stifle the flavor and mouth feel. NEVER chill and thaw solid chocolate! My decadent brownie recipe or Sunday’s shortbread are safer bets for traveling, but dried cherries, apricots (go for organic, unsulfured Turkish varieties – they have a sweeter, honey characteristic), or figs are equally delicious and require less pre-planning. Whichever combinations you choose, it’s hard not to throw a successful wine tasting or winery picnic. Who knew pairing wine with food was so simple?